Slacker has announced a new Personal Radio service that lets U.S. consumers create customized stations and listen to them on the computer or with a Slacker portable media player. The service lets is an Internet radio service that lets you create personalized radio stations. They plan to offer wireless Slacker portable media players that will effectively make your custom radio stations portable. The device will download a selection of content and advertising from Slacker, and you will be able to listen to it anywhere you like. While the Slacker is being called an “iPod-killer”, the services’ limitations could severely limit interest. The service forces you to listen a selection of music based on who they’ve cut deals with. The service is ad-supported, like radio, but the cost for players is comparable to iPods and other portable media players that let you avoid advertising. If you don’t like Slacker’s choices, you can skip tracks. You can only skip six tracks in an hour, though, which means that most of the time you’ll be listening to the tracks that they want you to hear, or advertising. The value of the device depends on the success of Slacker’s service. Based on these limitations, the Slacker does not look like it has a hope of being an “ipod-killer”. It could be the Zune-killer, though…..
Slacker Personal Radio Players will let music lovers play personalized radio everywhere they go. The new devices include integrated Wi-Fi and an on-board Slacker DJ. The Slacker DJ combined with the new Slacker caching system guarantees personalized CD quality radio stations to be played everywhere, even when not in Wi-Fi range. Slacker Basic Radio is advertising funded and will remain free to use on Slacker software and portable Slacker Personal Radio Players, while Slacker Premium Radio will launch later in Q2 2007 at $7.50 per month. The free beta Slacker Personal Radio service is available now at http://www.slacker.com. 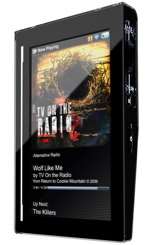 Slacker Premium Radio will be available in Q2 2007 and Slacker portable devices in early summer. The Slacker Satellite Car Kit will be offered in the second half of 2007. Poorly written article with typos aplenty! So not worth it. I rater just keep listening to Slacker on my computer. At least it’s add free there. Not sure I understand the negative slant on this one. I’ve been listening to Slacker for about 6 months, bought the portable player in March and I’ve never felt like I was being forced to listen to anything. All of my custom stations play exactly what I like, and their genre stations are better than anything I could make on my own. I have to think based on the way this story was written than you haven’t really spent any time listening to Slacker yet. Give it a shot, I really don’t think you’ll feel like you are being made to listen to anything you don’t want to hear.